Deep blue indexes and hands glow mystically from the depths of a totally 21st century black carbon fiber dial. Topped by a carbon fiber bezel and flanked by black ceramics on the pushers and crown, a black PVD-finished titanium case is tantalizingly offset by blue top stitching on a black rubberized calf leather strap. This is the 2014 edition of the C1 chronograph – a new chapter in the outrageously handsome symphony that has made its predecessors iconic. Like its recent siblings, the new C1 is slimmer and sexier, larger and leaner than the original C1, while retaining the unmistakable DNA of the line and its brand heritage. Pared down to a svelte 15.10mm in depth from the original 16.7 mm, the larger 47 mm case is crafted in light-as-air grade 5 Titanium. For enhanced durability and modern elegance, the original C1’s more rugged, rubber-coated metal bezel has been replaced in this version by the hard-wearing carbon fiber for true up-to-the minute style and contemporary sophistication. Molding to the oblique curve of the wrist, offering greater comfort and ingenious refinement, the strap is finished with a black, PVD-treated titanium deployment buckle with embossed Concord cover. 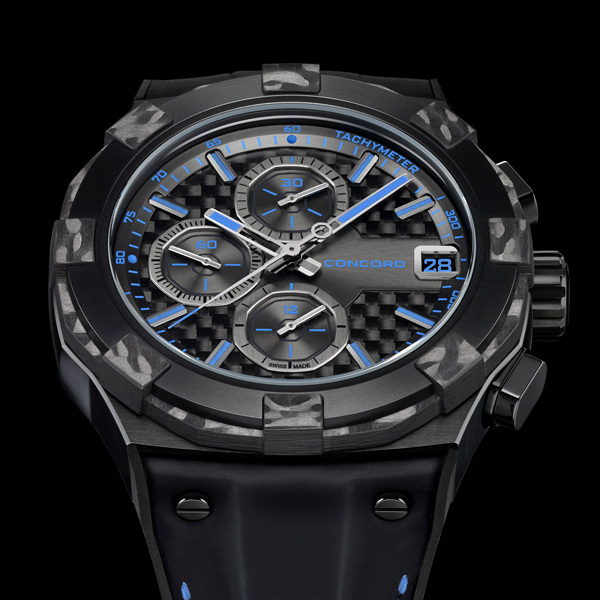 From the subtle new case-back etching declaring ‘Audace–Savoir-Faire–Avant- Garde’ to the less prominent screw-down titanium crown with black PVD and black ceramic decors, the C1’s ingenious new refinements blend artfully with its signature octagonal bezel and chronograph counters, and applied ‘C’ logo curled around the date window. The result is a re-envisioned, modern design that masterfully ensures the new C1 Chronograph’s place among the 21st century’s league of top watch contenders. Powered by a mechanical, self-winding movement with snailed bevel rotor, vertical Côtes de Genève and ‘C1’ engraved in the center and 48-hour power reserve, the new Concord C1 is protected by a 2 mm thick sapphire crystal with anti-reflective treatment. 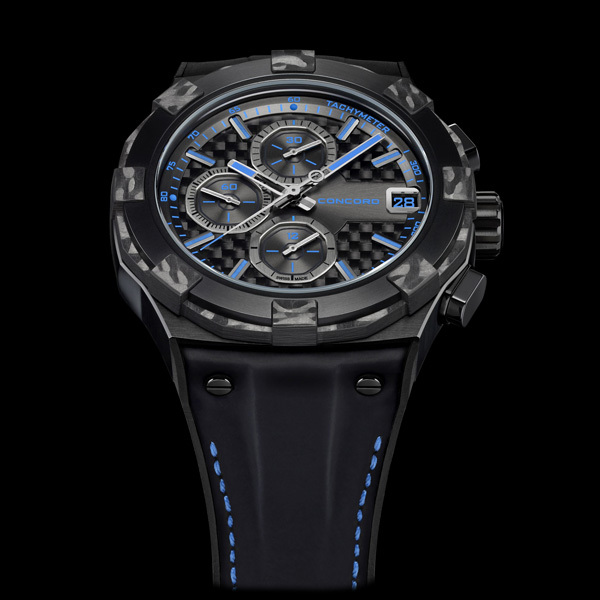 The black carbon fiber dial sports a 30-minute counter at 12 o’clock, 12-hour counter at 6 o’clock, small seconds subdial at 9 o’clock, date window at 3 o’clock and a center-mounted chronograph sweep seconds hand. With artfully altered DNA and the avant-garde spirit of its larger-than-life older sibling, the 2014 C1 Chronograph is living, steadily beating proof, once again, that intriguingly less is definitely more.